Azad India Foundation (AIF) was founded by Yuman Hussain in 1998 to seed initiatives in education & primary health care. The organisaton's activities reach out to marginalised women, adolescents and underserved children from rural and urban areas of Kishanganj district in Bihar. 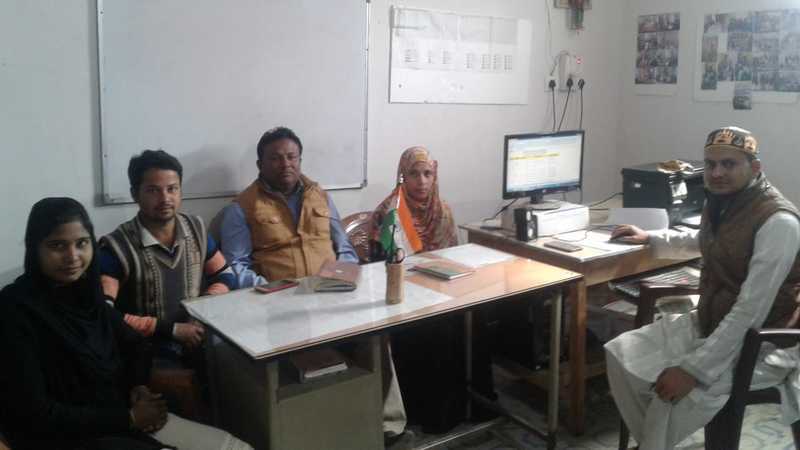 AIF has learning centres at 73 villages in three blocks of Pothia, Kishanganj and Thakurganj in Kishanganj, impacting 3,500 + children directly in the area. The children in AIF's centres are aged between 6-9 yeas and are either school dropouts or attending Madrassas. The centre's syllabus includes Hindi, English, Science and Maths. The main aim of the initiative is to ensure that children are ready to merge with mainstream education in state-run schools by grade 4. AIF is also our first partner translator to have completed its goal of translating 100 StoryWeaver books into Surjapuri. Surjapuri is spoken in pockets of Bihar, West Bengal, Assam and Bangladesh by 1.2 million people. In Bihar, the language is spoken in Koshanganj, Katihar, Purnia and Araria districts. In an email interview Yuman Hussain tells us why creating a hyperlocal library in Surjapuri is important and how AIF managed to reach its goal of 100 books in collaboration with its project and cluster coordinators. Tell us more about Azad India Foundation? Azad India Foundation (AIF) has been working in Kishanganj district of Bihar from 2001. It started its activities with a non-formal education and vocational training centre for women. Over the years, AIF’s focus has been on the development of poor and marginalized children, adolescents and women. Our activities are in the fields of women’s literacy, formal school education, non-formal education, rural employment, income generating skills, SHG formation, and community health programmes. Currently, we are directly working with 3,500 children in the primary classes through learning centres in 73 villages of four blocks — Kochadaman, Pothia, Kishanganj and Thakurganj. What are the long-term effects of a lack of easy access to resources in mother tongue languages for the communities that you work with? Surjapuri is local language spoken among a large section of people in the Seemanchal area (Kishanganj, Araria, Purea and Katihar) of Bihar. Unfortunately, we have not seen any books or resources available in the local language for the children. There is a possibility that these languages will be lost over a period of time as more and more people now speak Hindi. In fact, when we started translating books in Surjapuri and shared them with the children and community members they were unable to recognize their own written language. 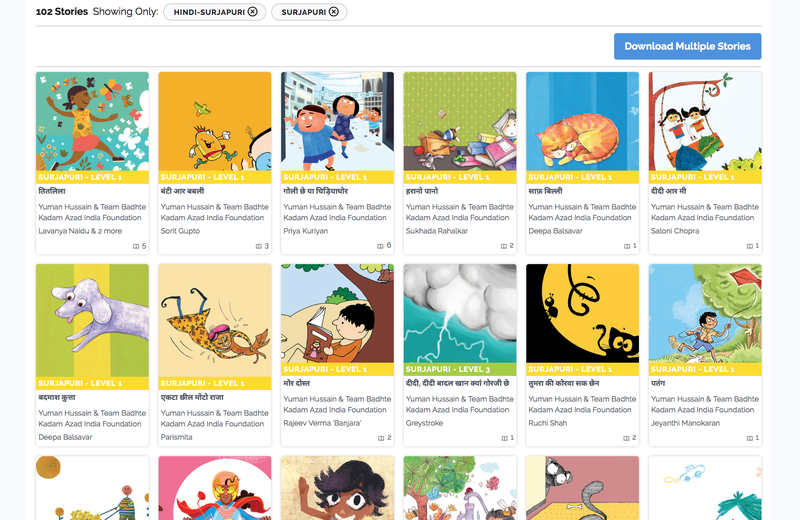 What are the benefits of creating a local digital library of joyful storybooks in Surjapuri? Creating a hyperlocal library at StoryWeaver will help our children have access to and preserve Surjapuri as their language. It would also enable them develop their reading skills and enjoy stories from all over the world in their own dialect. The digital library is free besides being easily accessible to every one. The mobile friendly feature has made it possible for the books to reach even remote corners of the country. Tell us more about your team of conributors and how you managed to translate and publish the 100 Surjapuri stories? The stories were translated by the team of project Badhte Kadam comprising cluster coordinators Aslam, Chand, Juhi and teachers. They were really excited about creating Surjapuri stories as it gave them an opportunity to contribute to the preservation of their own language. Muzzamil, who is the project head, reviewed the stories. The stories were chosen according to the themes and levels of the children accessing them. The toughest part was the typing and uploading of the stories that was done diligently by Saqlain, our computer operator. AIF is really proud and thankful to its team members for completing this programme within the stipulated time period with sincerity and enthusiasm. We will continue adding more stories and hope to bring the joy of reading to all children. How does Azad India Foundation plan to use this digital library of a 100 books? AIF plans to introduce these stories among the children at our learning centres. We are also spreading the message through social media about the StoryWeaver platform so that the community can access, use these stories and help in building this digital library further with many more books. This is a small step towards the preservation of local languages for which we are grateful to the StoryWeaver platform. You can read the Surjapuri stories translated by Azad India Foundation here.